, 256 g/L). The composition of Potassium Monopersulfate compound includesPotassium hydrogen peroxymonosulfate(KHSO5), Potassium bisulfate(KHSO4) andpotassium sulfate(K2SO4). Potassium Monopersulfate compound has relatively highredox potential. Therefor it is a highly effective oxidant and disinfectant. 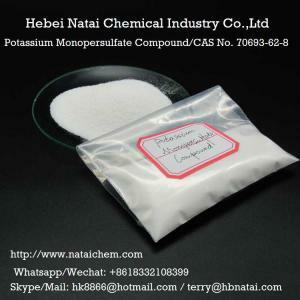 Potassium Monopersulfate compound, a stable,convenient and excellent acidity oxidant, is widely used in industries. It isused in oral hygiene, pool and spa water disinfection, water treatment,aquaculture, PCB etchant, Pulp bleach, wool fabrics shrink treatment agent,precious metal refining agent. Potassium Monopersulfate compound is also usedin organic synthesis, such as epoxidizing the double bonds of organic molecule,or as initiator in many radical polymerization. In addition, PotassiumMonopersulfate compound can oxidize the hydrogen sulfide or sulfur-containingsubstances in the waste water, provide oxygen in aquaculture, and bleach toremove stains at low temperature. 25Kg/ as customer request PP-PE Bag. UN proper shipping name: Corrosive solid, N.O.S (Contains monopersulphate compound). Transport hazard class (es): 8. Packaging group: PGII.. Storage: Keep in a cool, dry, well-ventilated place. Keep tightlyclosed until used. Store away from incompatible substance. Keep away from fireand heat source. Seal packaging. Pay attention to moisture and rain. Storedseparately with reducing agents, acids, easy (can be) burning materials.